New Greek Deal Between Private Investors Finalized by Saturday? Greece’s debt, which is mostly owned by the private sector, has already ballooned to about 350 billion EUR, just a little over 160% of its annual GDP. To pay for this monumental debt, Greece has had to implement strict financial controls and ask for external aid. It kept them afloat for a while, but now, Greece is in danger again. A little over a week ago, Germany, which is arguably the most powerful euro zone nation, warned Greece that its efforts are not enough and that it must do more to reel in its debt or else it will not receive its next bailout tranche. If the funds are withheld, Greece will not only fail to meet its next repayment worth 14.4 billion EUR and default, but it will also have to exit the euro zone. The solution that Greece has come up with is to make an agreement with the private sector to allow them to swap the existing Greek bonds they are holding for new ones at 50% value. This means that they are basically asking bondholders make write-downs and take losses. At first, markets were extremely pessimistic that a deal wouldn’t push through. This resulted in a strong euro-sell off. But now, comments from important financial officials suggest otherwise. Paul Mylonas of the National Bank of Greece and Greek Finance Minister Evangelos Venizelos said yesterday that a deal might be agreed upon by the weekend. This, of course, helped the euro rally and recover some of its losses. Over the weekend, the markets expect that Greece and the representative of bondholders, the Institute of International Finance (IFF), to discuss the size of the write-off and the rate of interest that will be rolled over to the new bonds. Before moving any further, let’s put a face to these bondholders that are being asked to take a bigger cut. Who are they exactly? These guys are mostly big banks who are heavily invested in the European financial system. That being the case, they know that if they don’t agree to writing off a bigger chunk of their bond holdings, their other European assets could suffer. Besides, these bondholders aren’t exactly clueless. They know that Greece won’t be able to pay the full value of its debts. Put yourself in their shoes: would you rather recover 50% of your bond holdings or get nothing at all? That being said, I don’t think we’ll see Greece default… yet. European officials will agree to provide aid to Greece and everything will be fine and dandy again. Now to ask the million dollar question: how will this affect the euro? If you ask me, I think this will most likely have a positive effect on the euro, at least initially. Bullish momentum could kick in as investors express optimism for the deal. But how long will it last? We’ve seen optimism come and go in the past, and this has created a solid euro downtrend peppered with retracements here and there. So who’s to say this recent bout of optimism won’t fade away again? 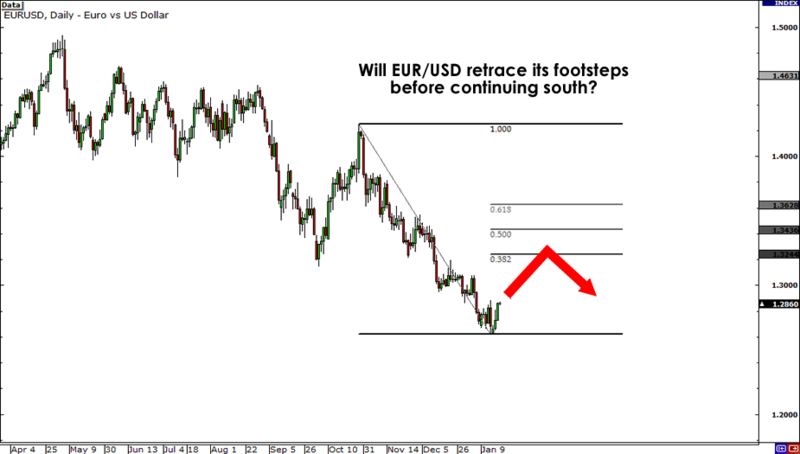 If you think about it, this could be a good chance to sell the euro at an attractive price level. If you were a holder of Greek bonds, would you share the burden and accept a write-down too?